The New York Times published an article about Arts In Education on April 4th and we couldn’t be more excited! Journalist Tammy La Gorce visited a second grade class at George M. Davis Elementary School while teaching-artist Galit Sperling “flopped, flailed, and chopped air” with the students. While in the classroom at George M. Davis, La Gorce got to see teaching-artist Galit Sperling in action. 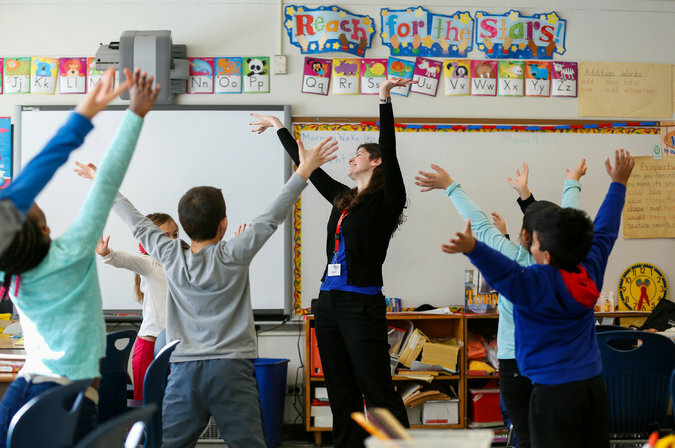 By going to the classroom, teaching-artists encourage students to express themselves in a variety of ways, and with Galit, it was with movement. Galit and the students tapped into their imaginations and had fun- all while learning as a precursor to the show. In this particular exercise, La Gorce found that creating an environment of pure imagination and expression helped the students with critical thinking and problem solving. La Gorce also visited with Arts In Education Programming Manager, Seth Soloway and Education Manager Ian Driver. By the 2016-17 school year, Mr. Soloway and Ian Driver, education manager for Arts in Education, hope to extend their reach to at least 15 schools within an hour’s bus ride of Purchase. Arts In Education’s goals look like they’re on the way to being achieved. Posted on April 13, 2015 by artsineducationpac	• This entry was posted in Uncategorized and tagged AIE, Arts in Education, Ian Driver, New York Times, Seth Soloway. Bookmark the permalink.